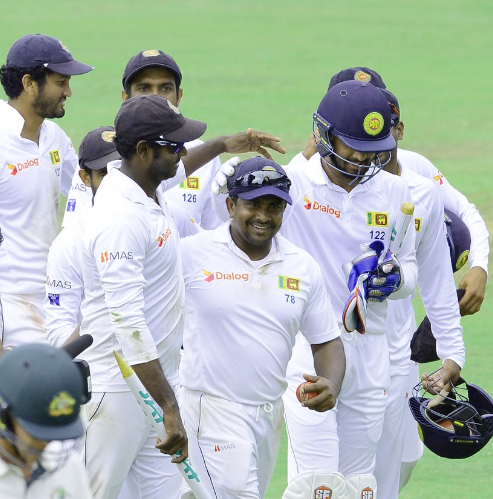 Sri Lankan Left-arm spinner Rangana Herath dismissed five Australian wickets including one from skipper Steven Smith as the hosts claimed a historic Test win over Australia on the tense final day of the rain-hit first Test in Pallekele on Saturday (June 30 2016). Sri Lanka stunned top-ranked Australia by 106 runs. This is only Sri Lanka’s second win over Australia on the longest format of the game. 21-year-old Kusal Mendis paved the way with a masterful 176, while 38-year-old Rangana Herath applied the finishing touches, with 5 for 54 in Australia's second innings, four of those wickets coming on the last day. For Australia, who began the day on 83 for 3 and was bundled out for 161, it will be a bitter pill to swallow. Not only was it the first defeat under Steve Smith's captaincy, but it came against the No. 7 team, who had just been beaten 2-0 in England. Final scoreboard between Sri Lanka and Australia in Pallekele. The next Test of the three-match series begins August 04 in Galle.